He is the Moon Elf King, using the power of the moonlight to protect and guide his own kind. Estes is part of the Support class in Mobile Legends, with high ability effects, durability and offense. 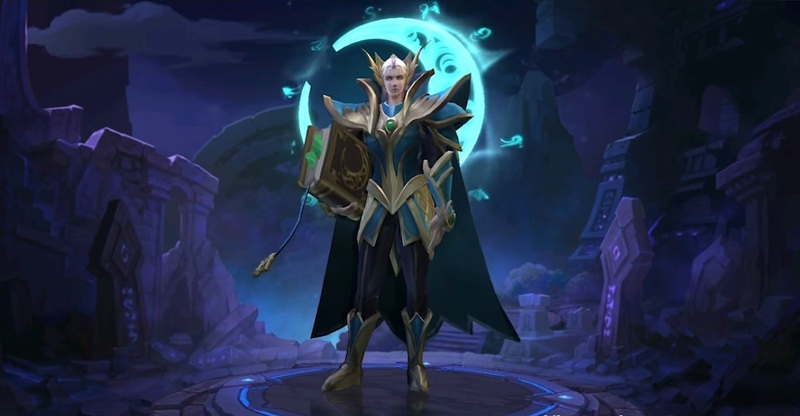 Like the rest of the heroe in the previous game, he is with 4 skills, one of them is passive and three are casters.His passive skill is the Code of Moon Elves. His basic attack can ricochet from the main target to the closest enemy and slows them down.Moonlight Immersion is his first caster. He restores HP and can link between him an ally hero. Next skill is Domain of Moon Goddess. Estes summons a domain, at a specific direction, dealing magic damage and slowing enemies movement speed. Blessing of Moon Goddess is his ult. when he turns into the King of Moonlight, he will enhancing HP regen for himself and for the allies. The key to winning in a battle is Estes’s ability to heal. You need to be all the time near allies, so they can deal damage consistently and grant you a win. So, whenever in battle, cast the Domain first, then use Moonlight Immersion. Keep his ult for last. You can use it if the allies need super HP regen. As a support, Estes needs a perfect build guide that will give him extra mana, mana regen and durability. In addition, you can choose those Flicker ability and Magic Emblem set. Guardian Relic – Increases Estes’s magic power. Also, every time he hits a target with a skill, the magic attack will increase by 15%. Arcane Boots – Adds 15 magic penetration and 40 movement speed. Calamity Scythe – Increase his magic power, mana and cd reduction. After casting a spell, the next attack will deal extra 150% magic damage. Frost – Casting a skill will slow the enemy. Dominance Ice – Reduces enemy’s movement speed and attack speed. Blood Wings – Increases Estes’s magic power for 150 pts. 0 Response to "Estes Best Build Mobile Legends"